Assembling an intercollegiate team from scratch is no small task. 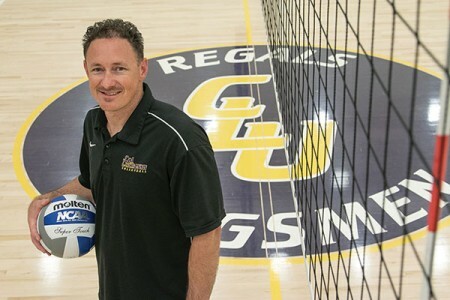 Men’s volleyball head coach Kevin Judd, who took the job in June, knows that well after helping to bring a men’s program to Moorpark College in 2002. The Raiders advanced to the state championship tournament in their first year and won it in their fourth. Now, Judd harbors hopes of early success in the spring. While continuing his longtime role as assistant coach for the winning Regals program, Judd has spent months combing the West Coast and the country for future Kingsmen. Although he’ll have the only men’s varsity team in the Southern California Intercollegiate Athletic Conference, the region is thick with players. Most local high schools offer the sport, and Southern Californian junior colleges compete in conference play. Judd’s ideal recruit is “athletic, competitive, but yet very humble” and a good student. “It helps to be tall,” he said. The team will have to travel the nation to compete in the small but fast-growing NCAA Division III sport. Before 2015-2016, the Banana Slugs of UC Santa Cruz were the only Division III men’s program in California. When Cal Lutheran last competed in varsity men’s volleyball, from 1978 to 1984, it was as a member of the National Association of Intercollegiate Athletics. Don Hyatt ’76, T.C. ’81, in the Alumni Association Athletic Hall of Fame for coaching the Kingsmen and Regals, led the men to a fourth-place finish in the national playoffs in 1979. Before becoming a Hall of Fame coach for the Regals, James Park ’86 played on the men’s team for its last two years of existence. “Those were probably two of the best years, and not just college, but of my life because some of the friends that I made there I am still in contact with today,” said Park, who later coached Kellee Roesel at Moorpark College. Roesel is the Regals head coach as well as assistant coach for the new Kingsmen team.